Katie is a passionate yoga student with sights on becoming a certified instructor in the near future. She was born and raised in Portland, Oregon, where she spent most of her time outdoors, despite all the rain. After graduating from Oregon State University with a degree in public health, her heart led her to the beautiful Georgetown, Texas in 2012. 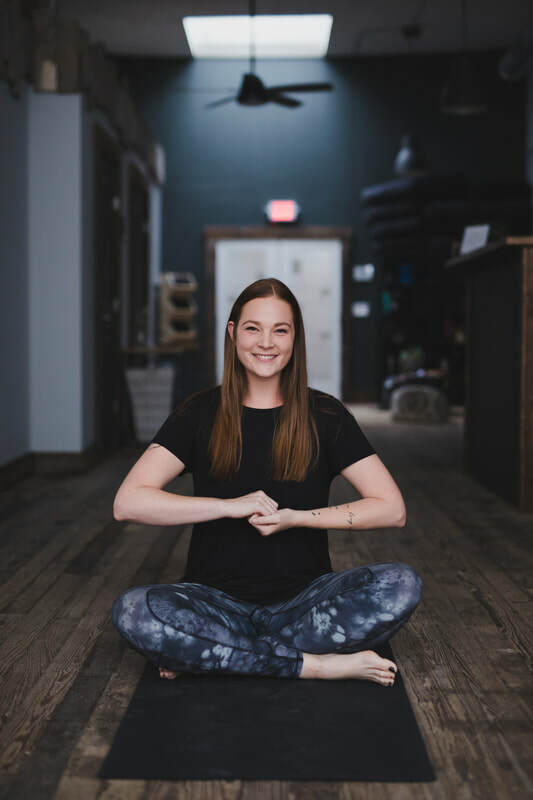 Katie's mother introduced her to Yoga as an adolescent and she took classes here and there over the years, but only for physical asana. It wasn't until a two-month adventure in New Delhi, India in 2014 where yoga really made a shift in Katie's life. That experience opened her eyes to numerous other styles of yoga which sparked interest in restorative yoga and its healing properties. Katie's favorite, yet most challenging posture would be pigeon pose! There are variations getting her closer to her personal goal, but she loves how it opens up the hip, chest and the feeling when she remembers to breathe and relax into the posture. ​In her free time, Katie also loves to explore the local hiking trails, learn new crafts (currently learning how to knit), and read with her tabby cat, Roscoe, snuggled close by her side. Katie's vision of being a warrior is someone that we become once we decide to move forward in life, no matter what life throws our way. A warrior has faced obstacles, and will face future obstacles, but will not let these times define them. To be a warrior is to be brave. To be brave is to live your best life, taking it one day at a time, while surrounding yourself with fellow warriors that share their own stories/journeys. Katie encourages others toward bravery by taking the next step. Whatever that may look like in your life right now, one step out of the comfort zone you have created for yourself (we all do it), could mean big and beautiful changes ahead. That’s what Yoga does for her each day - taking her a step closer to living her best life.